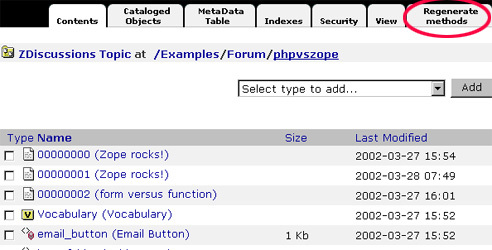 Want to add a little interactivity to your Zope portal? Take a look at ZUBB, the modestly-named Zope Ultimate Bulletin Board. One of the nicest things about online portals is the amount of user interactivity they offer via their discussion boards and online chat rooms. A prime example of this is Slashdot (http://www.slashdot.com/), which has hundreds of comments on every new topic or article posted on the site; reading them is always an entertaining experience, and they add a wonderful sense of community to the site. Why am I bringing this up? Because I've been playing with Zope a lot lately, and one of my recent projects involved building a Zope-based portal which included a discussion forum. At first, I thought that I would have to design and build this forum myself from scratch - until a search on Google and Zope.org turned up a very neat little Zope Product named ZUBB, which offered all the features I needed. Installation was a snap, the package was stable, full-featured, and easy to customize, and - best of all - it worked like a charm, allowing me to add Slashdot-type discussion boards easily and transparently to my Zope-based site. If this is something you've always wanted to do, but never known where to begin, this is your lucky day - over the next few pages, I'm going to guide you through the process of installing, using and customizing ZUBB on your Zope portal. Keep reading! First of all, what the heck is ZUBB? In the words of its author, ZUBB, or the Zope Ultimate Bulletin Board, is "...a threaded discussion board based on ZDiscussion and UBB (Ultimate Bulletin Board)." It provides a simple, user-friendly discussion board for portal members, and includes support for features like message posting and replying, message threading, and subject/body search. Of these, the first five files should get installed to the <Zope>/lib/python/Products/ZDBase/ directory, while the last should get installed to the <Zope>/import/ directory. Once that's done, restart Zope and go to the Product Management section of the Zope Control Panel. 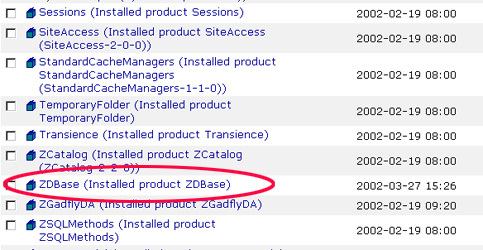 You should see ZDBase in the list of installed Products. 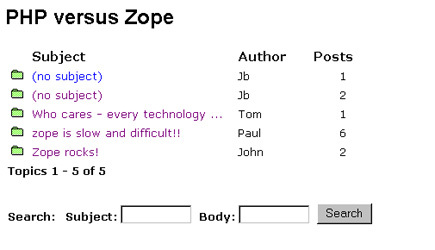 You now need to import the "ZDiscussions.zexp" package into Zope. Hit the Import button on the Product Management screen, and enter the filename "ZDiscussions.zexp" in the "Import filename" field of the resulting form. Zope should now import the package and return you to the main Product Management screen. Make sure that the file is in the <Zope>/import directory of your Zope installation before performing the step above. 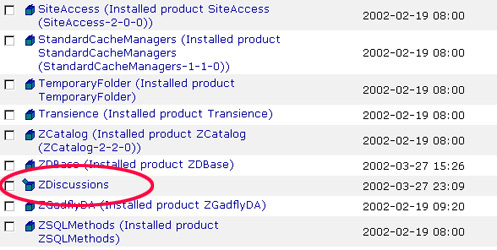 Once the package has been successfully imported, it will show up in the list of installed Products in the Zope management interface. You can now begin using ZDiscussions on your site. 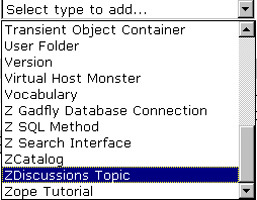 Once you've got ZUBB installed, you can use it by creating an instance of the ZDiscussions Topic object in the appropriate location in your Zope site. Remember to give this topic an ID and a title; this will be used as the subject for the topic thread, and you will not be able to change it later. 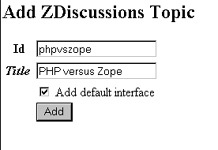 In this case, I'll assume that the topic is "PHP versus Zope"
Once the topic has been added, click into it and use the "Regenerate Methods" function (at the top right corner of the page) to create all the required DTML methods for the discussion board. At this stage, you can post a new message on the topic (each message is referred to as a ZDiscussions item), reply to existing messages, or search existing posts for a particular text string. Posting a message is the fundamental activity here - this message may either be the start of a new thread, or an addition to an existing thread. 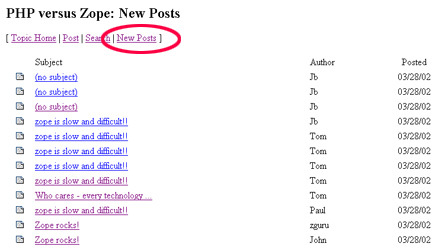 In order to post a new message, use the "Post" function that appears near the top of the discussion board. The resulting form allows you to enter basic user information - your name and email address - together with the contents of your post. Once submitted, your post will appear in the ZDiscussions discussion tree at the root level (since it is a new message). and your message will be attached to the discussion tree at the appropriate node. Notice how the number of replies to each thread in the discussion board is recorded and displayed to the user - this is an easy way to identify which topics are "hot", or generating the maximum amount of user activity. 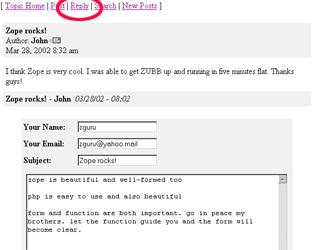 ZUBB also comes with a fairly adequate search engine, which lets you search for messages either by subject or body. This search engine is accessible via the ZUBB function menu at the top of every page. 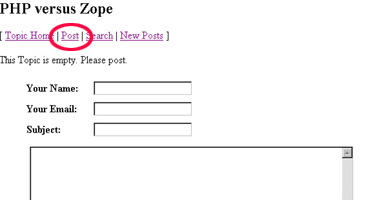 This search engine returns a list of posts matching the search term, ordered by date (not thread). 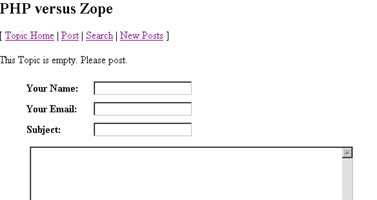 Users can then select individual posts to read them, and reply to them if required. In addition to this, ZUBB also features a fairly cool function named "New Posts" - this provides a list of all the newest messages posted to the board, regardless of which message thread they belong to. This is a quick and useful way of seeing all the new messages that users have added to the board since your last visit, especially if you're a frequent visitor. It's quite possible that you won't like the plain-vanilla interface that ships with ZUBB by default. Not to worry - as with all things in Zope, customizing the appearance of the board to your own particular requirements is fairly simple. You can now easily alter the appearance of the pages by modifying the style rules in the CSS file. If you take a look inside the folder containing the discussion board in the Zope management interface, you'll see a large number of DTML methods. Each of these methods contains, in addition to Zope program code, regular HTML formatting instructions that can also be used to alter the layout of the Web pages that make up ZUBB. Using the Zope management interface, it's fairly simple to customize the appearance of each of these elements...and, if you're familiar with DTML, even alter how they work. And that's about it for the moment. ZUBB is a very neat little Zope product, one that's both easy to install and simple to customize and use. If you run (or are contemplating running) a Zope-based Web portal, you should check out this application, and perhaps use it to add a welcome sense of community and interactivity to your Web site. In case this sounds interesting, take a look at the following links...and, until next time, stay healthy! Note: All examples in this article have been tested on Linux/i586 with Zope 2.5 and ZUBB 0.7.1. Examples are illustrative only, and are not meant for a production environment. Melonfire provides no warranties or support for the source code described in this article. YMMV! This article was first published on 19 Apr 2002.